Lift your newly started salon business with mobile applications to get immediate positive results. Beauty Salon is one of the place where we never get free space. Sometime the customers get bored to wait in line. Why don't you offers them own salon mobile app? Isn't great that people itself find, book appointments as per their time, pay online. Salon owner will now only schedule the customers appointments making less effort and big achievement. 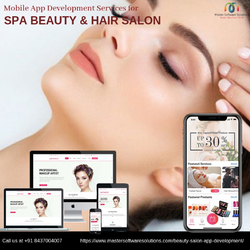 Contact us at Master Software Solutions official store +91 8437004007 to get the best beauty salon app to offer the on-demand services.